When: This tour is offered by request only. If you would like to take this tour, please send us an email at info@extremehistoryproject.org. We would be happy to schedule a tour for you or your group. Where: Meet at the Beall Park Recreation Center, 415 N. Bozeman Ave. This tour caps at 25 people so please arrive early to secure a spot. If you would like to reserve a spot on the tour, give us a call at 406-220-2678 or send us an email at info@extremehistoryproject.org. Bozeman was not built by the Nelson Story’s alone. It took a large community of masons, shopkeepers, brewers, builders and farmers to build Bozeman’s infrastructure in the late 19 century. The North Tracy Avenue Historic District contains the most significant concentration of historic residential architecture north of Main Street and is a representative portion of what was once a quite extensive historic residential area. Some of the houses in the district are among the most significant examples of vernacular architecture in the city. This tour gives an overview of the “working class” or blue collar section of Bozeman. 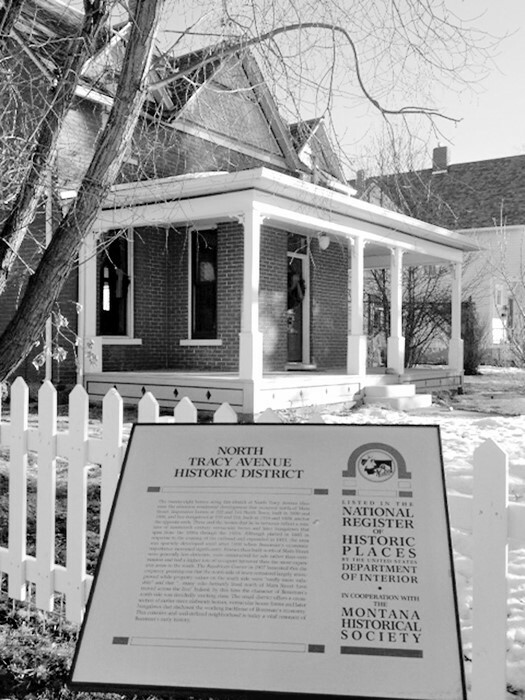 The houses in the North Tracy historic district are modest vernacular structures that show the needs of middle class Bozeman.